The AZBlueMeanie reports this morning that the AZ House GOP delegation votes to maintain the Trump swamp of conflicts of interest and corruption. And what did our CD2 Rep. Martha McSally do? What else? She behaved just as she has always done – voted consistently with Trump’s views and toed the GOP party line. Our Arizona House GOP delegation, including the local media’s invention of the mythical moderate Republican Rep. Martha McSally, have consistently voted to maintain the Trump swamp of conflicts of interest and corruption by rejecting any transparency and public disclosure. Voting information below is from the Daily Star’s Capitol link: How members of Congress from Aritona voted on major issues (h/t AZBlueMeanie). Voting 230–193, the House on April 27 blocked a Democratic bid for floor debate on a measure now in committee that would start congressional oversight of ethics and conflict-of-interest issues involving President Trump, in areas ranging from the public disclosure of official visitor logs to overlaps between the president’s business holdings and official acts. A yes vote was to quash the Democratic measure during debate on H Res 280. Combined with McSally’s consistent (that would be 100%) voting along Trumpian lines, these votes give lie to the new and improved Martha McSally. The make-over is purely cosmetic (cf. head shots) and Your Scriber debunked the politically moderate make-over in the 2014 election season: A Magical Moderate Makeover for Martha McSally (posted here on July 28, 2014). It’s MMM for short. (Martha McSally, speaking) “I am running for Congress I don’t walk by a problem. I have a fire in my belly to make a difference and when things are broken, I want to fix them." Fix. Verb. To vote against transparency and accountability and to vote for conflicts of interest. 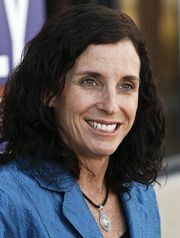 Clearly, McSally’s handlers learned from her previous defeats and are presenting a softer, kinder, more centrist image. Just remember: what I recall from a 2012 primary debate is that she is the one who said there is no difference between her and her then opponent, Jesse Kelly, with respect to core values. That’s why I place no credibility in the new McSally. The old Colonel McSally still lurks, but now just gone MIA – Moderate In Appearance. That was the situation in 2014 and 2016 and continues to this day. CD2 is but a political stepping stone for the Magically Made-over Moderate Martha McSally. It will continue to be in her interest to vote along with other Trumpists until the CD2 voters give her the heave-ho.